There were plenty of winners and losers this week, with the leading retailer jacking up what it pays its lowest-level hires and underwriters turning on a tech company they took public last month. Walmart, the world's largest retailer, is raising its entry-level wages to at least $9 an hour in April. That will be bumped up to at least $10 an hour come February of next year. The move may not entirely silence the activists championing for Walmart to pay at least $15 an hour and pave the way for unionization, but it's at least a baby step in improving its public image. The move will mean that the average full-time wage earner at Walmart will be making $13 an hour. Walmart also will invest $1 billion this fiscal year in improving its store operational structure, giving associates more control over their schedules and a closer relationship with their supervisors. Walmart isn't just giving more money to many of its 1.3 million U.S. workers. Shareholders are also getting in on the fun as the discount department store chain boosted its quarterly dividend rate. The underwriters that took Box public at $14 are finally free to issue their ratings on the stock, and they're not a very enthusiastic bunch. A whopping seven of the eight analysts initiated coverage of Box this week with a ho-hum "hold" rating. The lone underwriter to offer a bullish note was Credit Suisse, slapping shares of the cloud-based data storage provider with an "outperform" rating and a $24 price target. This is definitely a cutthroat market for digital lockers, but it's not as if the stock is trading that much higher than the $14 price where they helped take Box public. Shares of floor-tile retailer Tile Shop (TTS) and carpet-tile maker Interface (TILE) moved higher after posting encouraging results. Tile Shop saw its quarterly sales climb 9.5 percent from the prior year's holiday quarter, fueled almost entirely by the 14 new stores that it opened through 2014. Interface saw sales of its tile-shaped carpets climb 8.1 percent with double-digit growth in the U.S. and Asia. Investors fearing that the housing market stabilizing would cool off demand for home improvement projects appear to be wrong. Consumers are taking to tiles and carpet tiles these days. The telecom giant rolled out its ultra-fast fiber broadband in Kansas City on Tuesday, giving customers hungry for the promised speed of a gigabyte per second a way to get it for $70 a month. The reason that AT&T is making the cut as a loser this week is that reports are slamming the company for offering a privacy add-on where guests pay an additional $29 a month so their surfing habits won't be tracked. Wait a minute. These premium customers are being followed online? Letting the public know that not having access to that information is worth an extra $29 a month doesn't look very good. It's not a bad time to be a travel portal. Last week it was Expedia (EXPE) agreeing to shell out $1.34 billion for smaller rival Orbitz, a move that places the most popular sites through Europe and the U.S. in the hands of just Expedia and Priceline. This week it was Priceline stock racing higher on Thursday after it posted another blowout quarter. Adjusted earnings rose 22 percent to $577 million or $10.85 a share, once again blowing past analyst expectations. Bookings soared 17 percent to $10.7 billion, with the lion's share of those travel plans being booked by European customers. 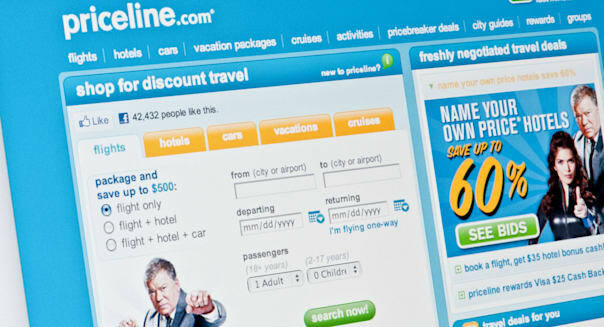 Priceline's a globetrotter in more ways than one.